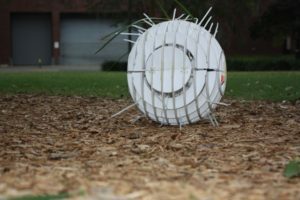 This robot, “paranoico”, was created in FSU Art’s Mechatronics I course as a creature from some time in the future where the brain has fully developed into an organ of pure survival. This robot will do anything to keep itself away from threats. Any sudden or loud movements will be evaluated as a threat and will be acted upon by moving away from the noise to a quiet and secluded area. The goal was to create a robot that in order to get close to and examine you must make yourself approachable and non threatening. Check the video on FSU Art’s youtube channel.